Apparently it is not the done thing to do the school run in your pyjamas, or so my mother-in-law tells me. But my son’s nursery is so close that, if we’ve all had a bad night’s sleep, it’s sometimes really tempting to keep my pjs on for drop off. I haven't resorted to this yet, in part because I work from home. Those of you who also work for yourself will know that there are certain things you need to be on top of to feel like a pro when you're working from home. I need to be pretty strict with myself when it comes to my wardrobe as it’s all too easy for me to throw on any old thing before I run out the door to nursery. I automatically opt for comfort and convenience but then inevitably end up feeling like a hypocrite: how can you write about style when you’re wearing THAT? And even though going out to meetings is a more casual affair in Bristol than in London, I’m pretty sure rocking up wearing my pjs wouldn’t quite be de rigueur. When Matter Prints got in touch a few months ago I jumped at the chance to collaborate with them. I love their aesthetic as well as their ethos to inspire their customers to value craft and provenance. Their collection is effortlessly stylish and mindfully produced so when they asked if I’d like to field test something from their collection I couldn’t say no: this could be the answer to my working-from-home style dilemma. It was hard to choose which piece I wanted to try but rather than simply being swayed by their stunning prints, I considered which garment would best suit my shape and my lifestyle. I think their cuts work best on women or men with a slender or straight silhouette. That is not me. I am blessed with what my Nanna used to call 'child-bearing hips' (she had a somewhat old-fashioned way of describing my attributes when I was a teenage girl). I’m curvy and usually need my clothes to be fairly fitted or tailored otherwise things tend to hang off my chest or hips creating an illusion of extra width or weight. 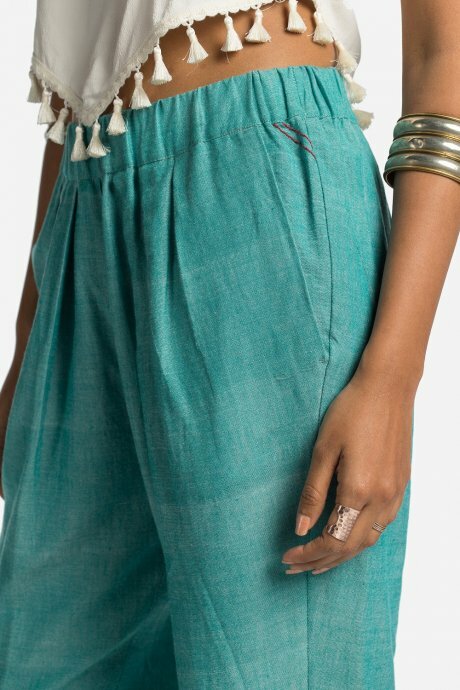 I chose to try the Easy Dhoti hand-loomed cotton trousers or ‘pants’ in Chambray Mint as I loved the colour and they looked as though they would flatter my shape more than some of the wraparound styles. They are fuller and more gathered around the waist and hips than I would normally choose but once I had a play with tops and sandals (and got a second opinion from my husband) I really fell for them. They are slouchy but not baggy because they are slightly tailored. Small details such as stitching across the bottom of the pockets (providing extra strength is an area that could get weak from wear) are evidence of them being made to last and, as the cloth is beautiful too, I love wearing them. 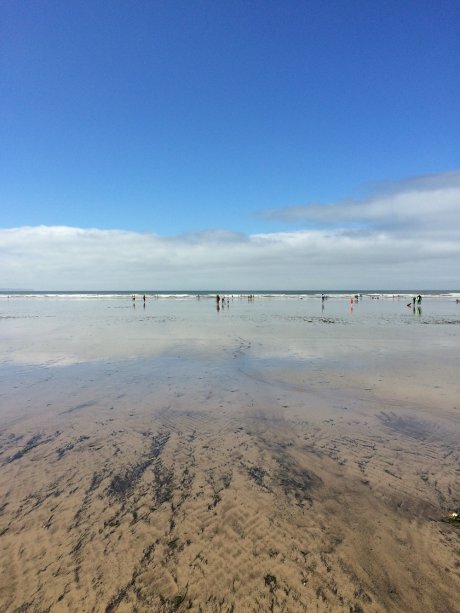 My new 'pants' arrived just before our late summer holiday – I could see how perfect they would be for a beach break in the Med or even a tropical getaway - but I had no idea how they would fare on a week away in the unpredictable climes of North Devon. The Easy Dhoti pants were in fact a great addition to my holiday capsule wardrobe: they were perfect on the beach as they are cool yet gave good coverage from the sun on a hot day and they’re easy to pull up around my calves for paddling with my toddler. They kept me warm on windy days when the sun refused to come out and were good for shopping or mooching around the glorious garden in our holiday cottage. Plus they have generous pockets which are always a bonus when you have a small person in tow. These trousers are as comfy as your favourite yoga pants or tracksuit trousers but ten times more stylish. So, they proved their worth on the beach but how would the trousers fare when I got back to real life in Bristol? Well, I love wearing them for the nursery run, for play dates on my ‘day off’ and for relaxing in the evening after a taxing day of toddler negotiating. I could even wear them to attend chilled work meetings. They are perfect for combatting my ‘what to wear when working from home’ style conundrum - I certainly don’t feel like a hypocrite sitting here writing about style whilst wearing these beauties. New customers can enjoy 10% off at Matter Prints with code 'TheGoodWardrobe', valid until 15th October. Matter Prints sent me these pants for the purpose of a review but I always strive to be honest and all views are my own.